I have lots of Sum ‘Em activities in my Teachers Pay Teachers store and I wanted to share a free one with you today! 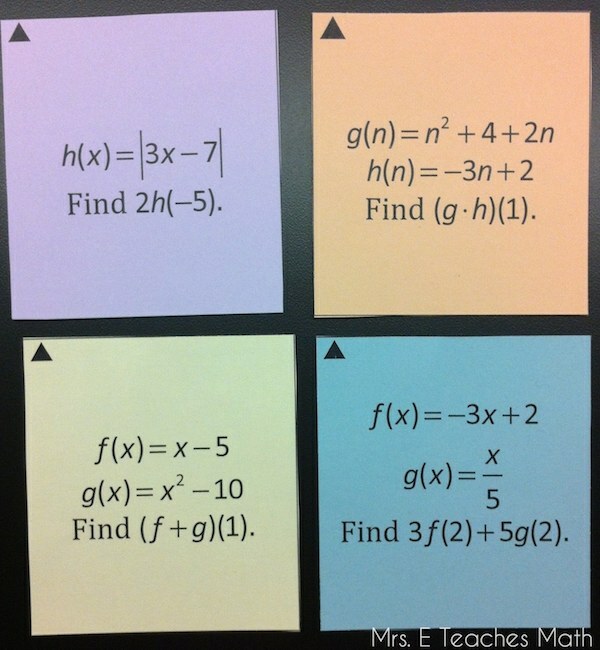 I originally created this for my Algebra 2 Honors students to practice function operations and compositions. Each of the pages should be printed on different colors of card stock. Then, the cards should be cut apart and organized according to their symbols. There will be six sets of cards. Students can be grouped in twos or fours. Each student takes a card, and works the problem on the card. When all of the students in the group have their answers, they add them up. The group will check their sum with the teacher. If they are correct, they will get a new set of cards. If they are not correct, they will work together to see where they went wrong. I don’t usually tell the group which answer is wrong. I have them figure that out themselves. 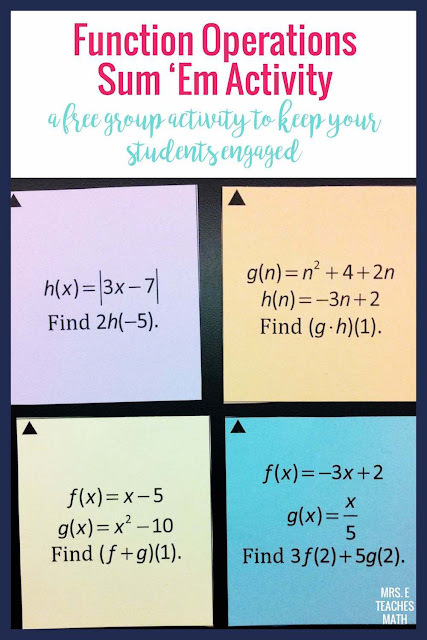 This is a great way to get your students to work together. You can download the Function Operations and Composition Sum ‘Em Activity from my free resource library. I hope your students enjoy it! Don't have access to my free resource library? Sign up below. Thanks for this activity. I will try it out on Friday. Bah! There should be 6 sets of 4. I normally make 8 sets, but I made these cards bigger. Thanks for pointing that out!